NASA's Cassini spacecraft has captured the highest-resolution-to-date temperature map and images of Mimas, one of Saturn's moons. The Mimas image on the right-hand side of the figure below shows the Pac-Man-like temperature map. 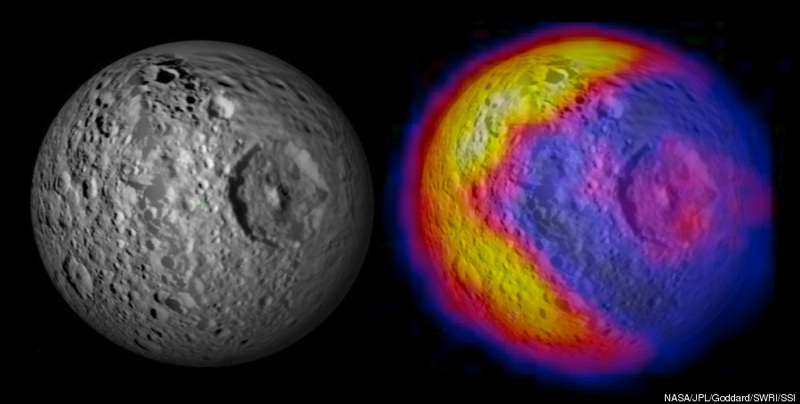 The image on the left-hand side shows Mimas in visible light and has 'has drawn comparisons to the "Star Wars" Death Star,' according to NASA. Check out more pictures from space, including gorgeous photos of mars, stars, earth as seen from space, and stunning images from NASA's sky-mapping spacecraft, WISE.